← Wild Horses Coundn’t Drag me Away. 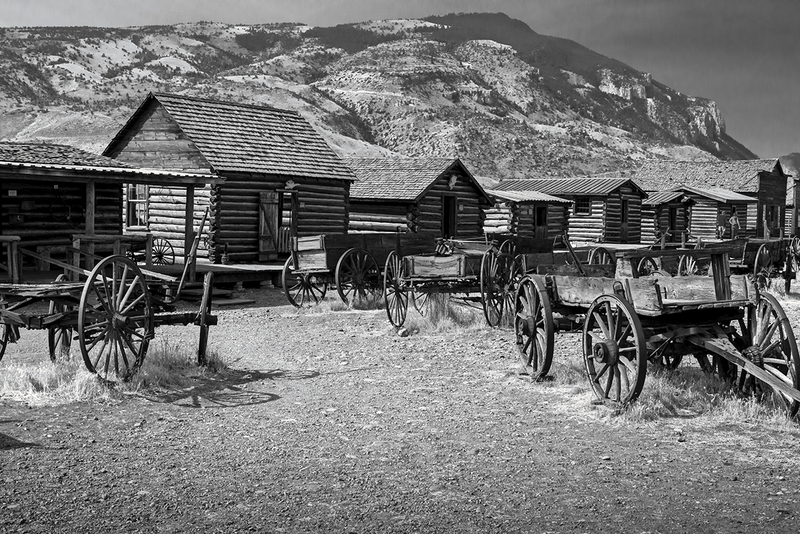 These are old, original cabins, businesses and wagons. 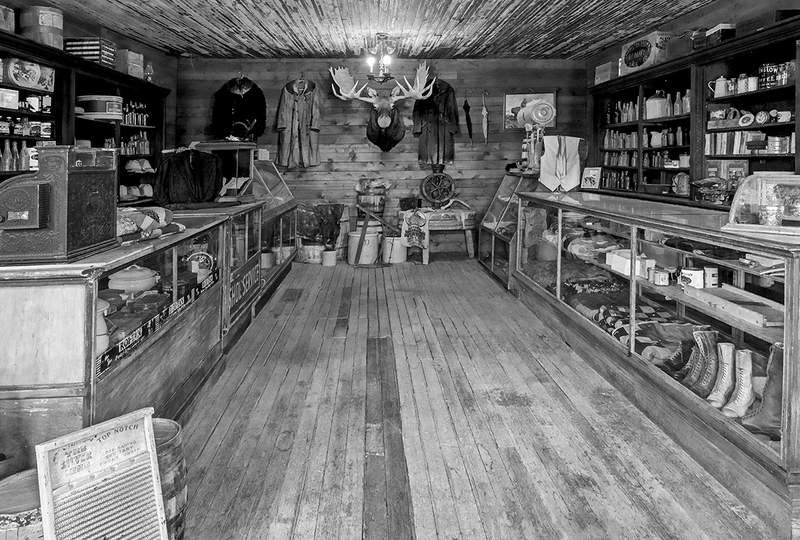 The cabins have been moved from their original location and rebuilt and restored here at The Old Trail Town Museum in Cody, Wyoming. 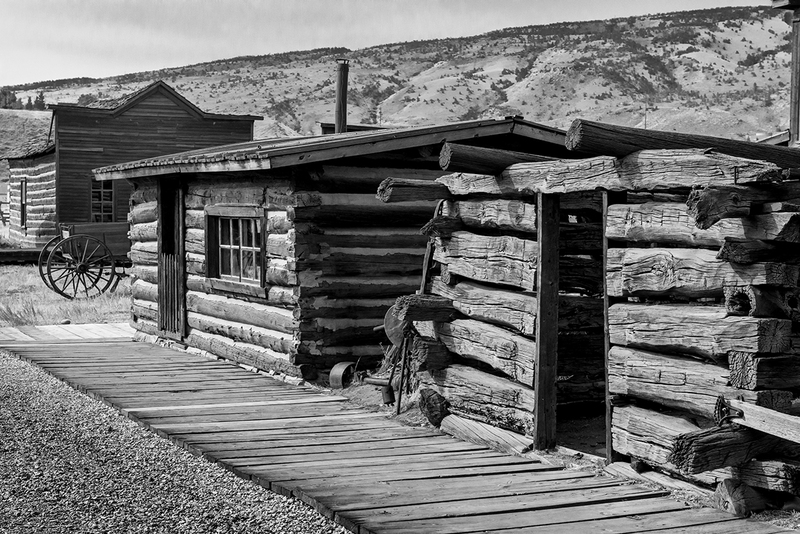 Probably the most famous of which is the Butch Cassidy and The Sundance Kid’s cabin. 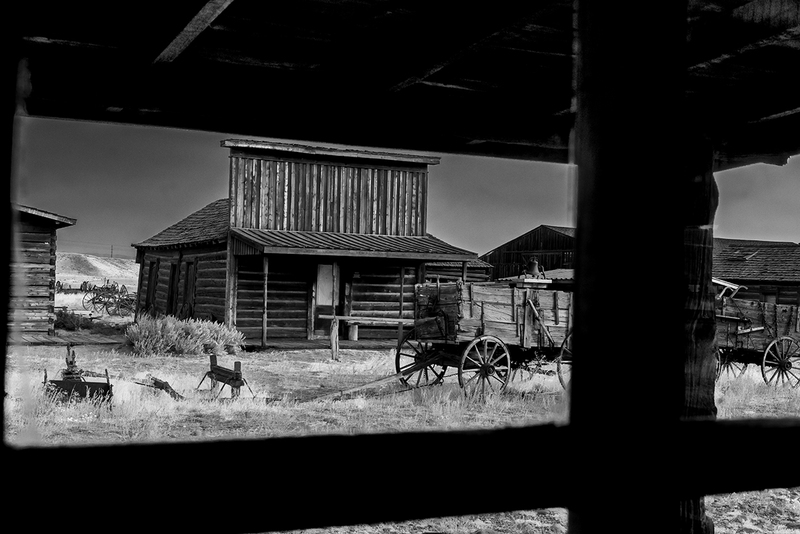 Looking out of the window from Butch and Sundance’s Cabin I expected to see the Sheriff and Posse explode out of the Livery Stable opposite ……..
…..in search of Butch and Sundance? On arrival at the entrance cabin, to buy our tickets, we got a full description of the museum, how it came about and what to expect going round. 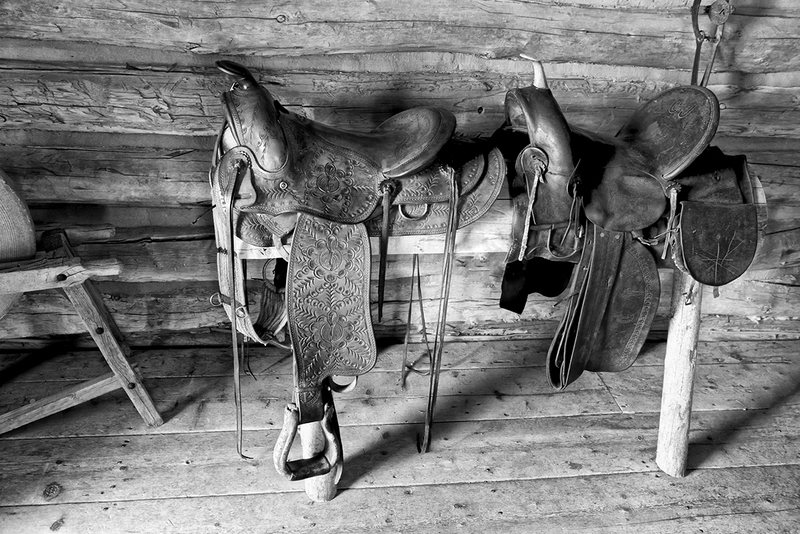 As we went round it was easy to imagine life in those days and smell and taste the Wild West! 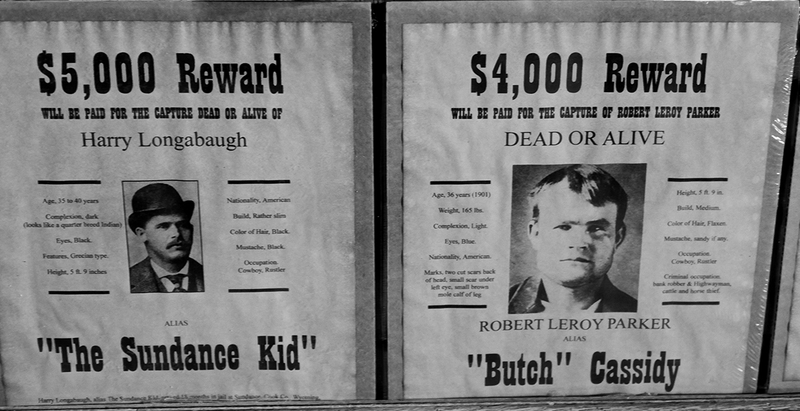 Most of the cabins were named and had information of the history/origins of the cabin or store. 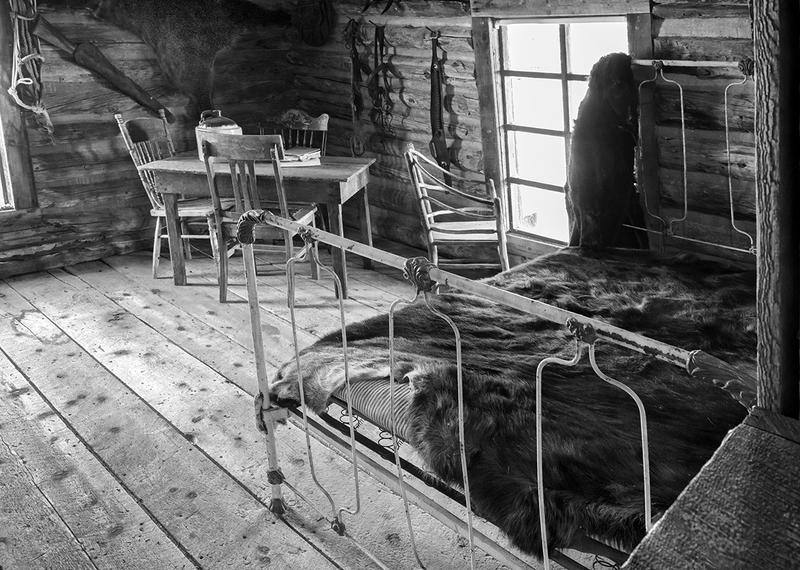 Great interiors for most cabins of artifacts from the appropriate era. 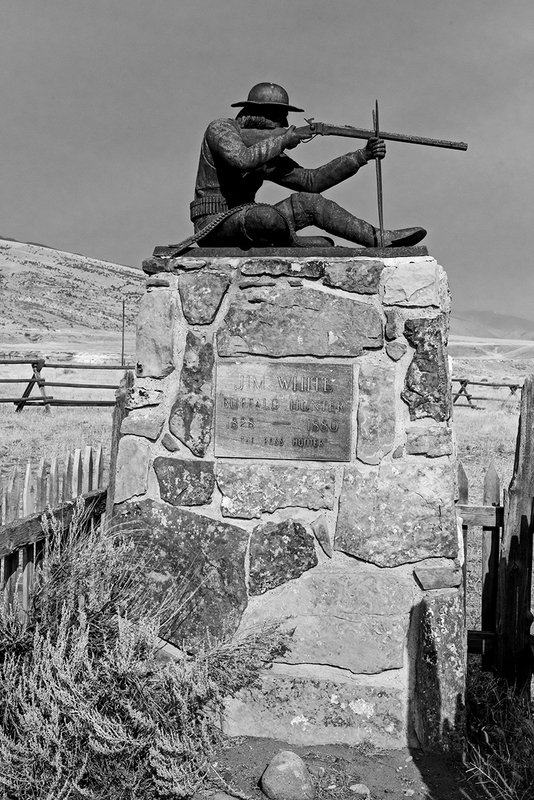 By going up one side of the “street” and coming down the other you see a few marked graves and monuments of renown men with the description of their do’ins: Jim White, John Jeremiah “Liver Eating” Johnston, John Colter, Jim Bridger and Buffalo Bill’s Grandson. Again the deceased had been moved here and reinterred. In the barns containing the carriages and wagons there was even an old hearse straight out of a horror movie. 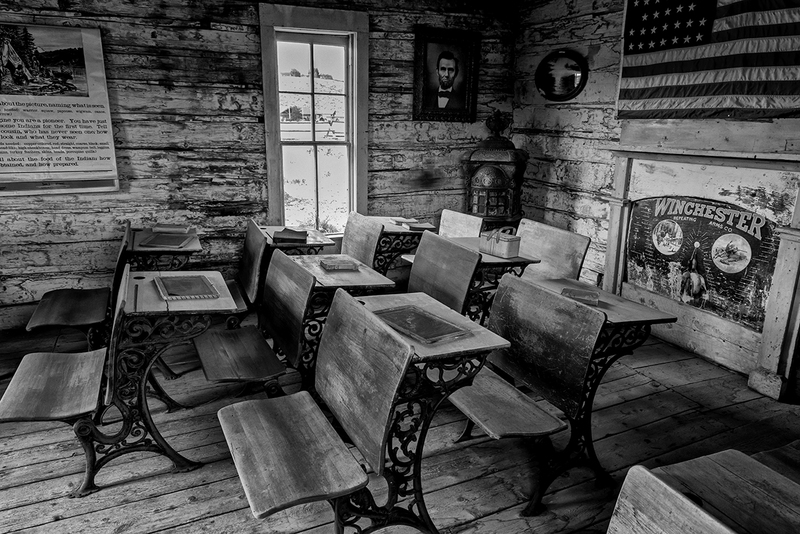 There was even a one room schoolhouse, I am glad conditions had improved when I went to school! In homage to the era and to try and give a sense of place and the atmosphere, all of the images from this visit have been made in black and white (and not because I just love black and white). I believe this monochrome view helps transport you back there. 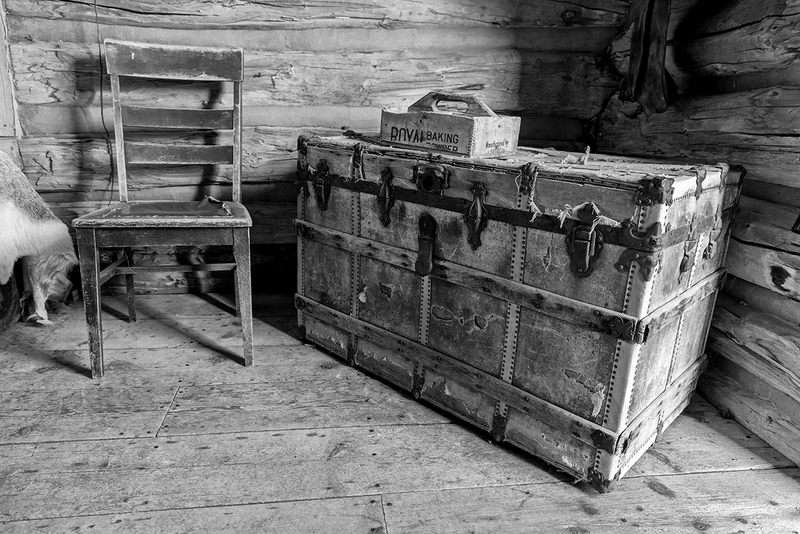 This entry was posted in History, Museums and tagged black and white photographs, Butch and Sundance WANTED Posters, Butch Cassidy and Sundance Kid Cabin, Cabins and Businesses from the Wild West preserved, Cody, Historic Museum, images available to license, Nikkor 24.0-70.0mm f/2.8, Nikon D800, One room schoolhouse interior, Photoshop, Prints available to buy, Richard King Photography, Silver Efex Pro, The Old trail Town Museum, USA, www.fulltimervingwiththekings.com, www.richardkingphoto.com, WY, Wyoming. Bookmark the permalink. 4 Responses to The Taste of the Wild West! Wonderful pictures, really enjoyed them. Wow, that looks like a really cool place to try and visit one day. My maternal grandfather was born in the Oklahoma Territory. They later moved out to Colorado and then back to the state of Oklahoma later. Whatever schools he attended were most likely one-room buildings like that. He got his start in the oil industry by running mule teams around the oil rigs. Farm boy that he was, he knew how to control a mule. He later completed the equivalent of a GED by correspondence and went on to work for Chicago Bridge and Iron as the foreman of a crew of boilermakers that went from job to job before eventually settling down in NJ and opening his own steel fabrication and tank erection company. He came a long way from the prairie!